This article gives an overview on FedEx Corporation, formerly Federal Express and FDX Corporation, and RCA’s involvement with the Space Mountain roller coaster in the Magic Kingdom theme park at Walt Disney World Resort in Bay Lake, Florida. The article also mentions, briefly, FedEx’s sponsorship of the other Space Mountain rides. 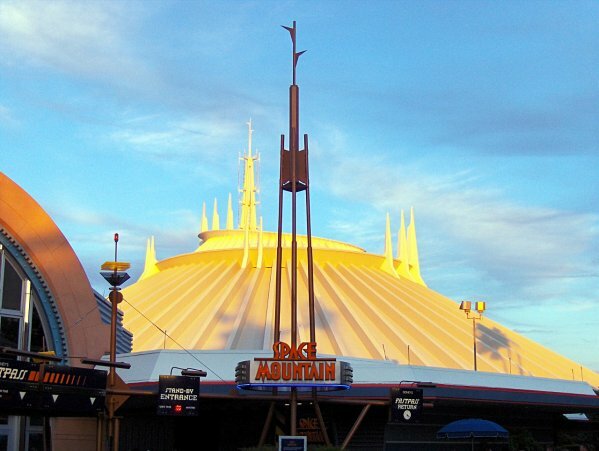 FedEx was as sponsor of Space Mountain from 1994 to 2004, according to multiple sites. According to wdwmagic.com, FedEx started ending its sponsorship in 2003 as FedEx signage was being removed from the ride 1. FedEx became sponsor of the ride after RCA in 1994 2. As part of their sponsorship of Space Mountain, FedEx employees were given access to a special lounge that was located inside the ride 3. Drinks and other refreshments were available to FedEx employees and their guests in the lounge. Another perk for FedEx employees was access to the front of the line or queue. FedEx employees were able to get to the front of the line by going through the lounge. One site mentions that the lounge only operated Monday through Friday 3. One famous feature of the FedEx sponsorship was the SMTV warning and ride safety video for the ride 4. The color scheme for Space Mountain was also designed to match FedEx’s orange and purple color scheme. You can see the color scheme below in the photo of the attraction, before the color scheme was changed to green and blue. Above Space Mountain in FedEx Colors photo by Joe Shlabotnik on Flickr. Modified by NavFile. Photo released under a Creative Commons License. Before FedEx was a sponsor, RCA Corporation was the original sponsor of Space Mountain at Walt Disney World. RCA was a large electronics company that built radio and television equipment and provided other services related to those two sectors. The company was known as Radio Corporation of America before 1969. RCA was the original firm that provided financial support to Disney and WED Enterprises to develop Space Mountain. RCA was the official sponsor of the ride from opening day in 1975 to 1994. As with most sponsorships, RCA’s logo was displayed throughout the building that houses the ride. The other Space Mountain rides at the other theme parks were also sponsored by FedEx. Space Mountain at Disneyland (California) was sponsored by FedEx some time in 1993 or 1995. Space Mountain at the Magic Kingdom in Walt Disney World Resort has not had a sponsor since FedEx left in 2004. Many of the rides in the Magic Kingdom do not have a sponsor. The other Walt Disney World Resort parks do have rides that have sponsors. In Epcot, Test Track and Spaceship Earth both have sponsors (Chevrolet / General Motors and Siemens). Out of all of the rides in the Magic Kingdom, Tomorrowland Transit Authority PeopleMover is the only ride that has a sponsor (Alamo / Enterprise Holdings). Space Mountain is a roller coaster that was developed by the The Walt Disney Company (Disney) and its various subsidiaries. Disney has created multiple versions of the ride at its theme parks around the world. The original Space Mountain is the one that is located at Walt Disney World Resort in the Magic Kingdom theme park in Bay Lake, Florida (the Orlando, Florida area). More information on Space Mountain can viewed by visiting the other pages listed in the menu on this site.